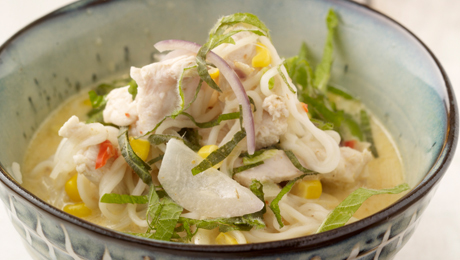 This coconut and chicken noodle soup is just fabulous! Cook the noodles as per pack instructions, drain and set aside. Place the green beans and sweetcorn in a pan of boiling water and cook for 5 minutes until tender. In a separate pan place the coconut milk, chicken, fish sauce, garlic, chilli and ginger, bring to the boil. Add the mangetout and sweetcorn and simmer for 3 – 4 minutes. Divide the cooked noodles between the serving bowls and ladle over the soup, sprinkle with some fresh coriander.